In the golden state, solar is booming with over one gigawatt of rooftop solar installed. Still, many of us Californians are frustrated with solar – frustrated there is not more of it. We shouldn’t stop at frustration. We should be outraged. Greedy utility companies, and complacent politicians are depriving Californians of clean and affordable energy. Powering much more our state with solar is absolutely doable. That is, if the major energy players put the full weight of their agencies behind it. A slew of articlesin recent weeks featured this graphic comparing equal sized solar systems in Germany and the U.S.
Why in Europe, where most goods cost twice as much as in the U.S., are solar systems half the price? The answer is Red Tape. Mountains of it. Paperwork, fees, delays, changes in policy… These are the problems that mire American solar, making it twice as costly as German sun power. Demand for solar will increase as prices drop (really). Residents, alongside the solar industry, must demand the roadblocks holding back renewable energy be removed. 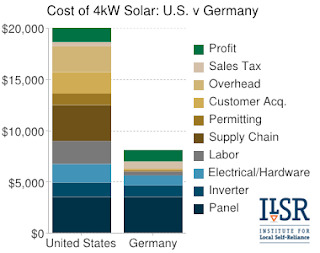 Insist on German-priced solar in the U.S. Support Vote Solar and Citizens Climate Lobby.